One of my clients very kindly invited me out to dinner tonight, and grabbed a couple of more guys to share a few bottles of wine together. As it turns out, my client is an old friend of Sheets', so I looked forward to a relaxing evening amongst friends. We headed to Aberdeen Marina Club after work, and stopped in at La Cave for some bubbly while we waited for reinforcements to arrive. The Egly-Ouriet Brut Tradition Grand Cru was nice and smooth, very balanced in terms of acidity and ripeness on the palate. Somewhat caramelized nose. After finishing our bubbly, we moved to the Horizon (海天閣) for some dinner. Our host had already arranged for the wines to be dropped off and decanted, and we would order some simple dishes in batches to go along with the different wines. 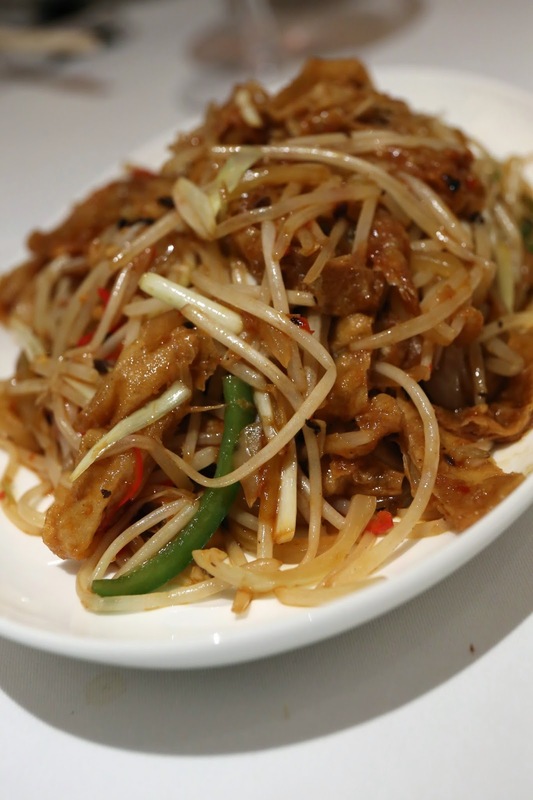 Crispy bean curd (脆皮黃金豆腐) - this was OK, largely saved by the deep-fried minced garlic and chili. Pan roasted French beans, shrimp paste (百花煎釀四季豆) - pretty interesting, as this is usually done with green chilis or bell peppers. Barbecued pork, honey glazed (蜜汁叉燒皇) - pretty decent. 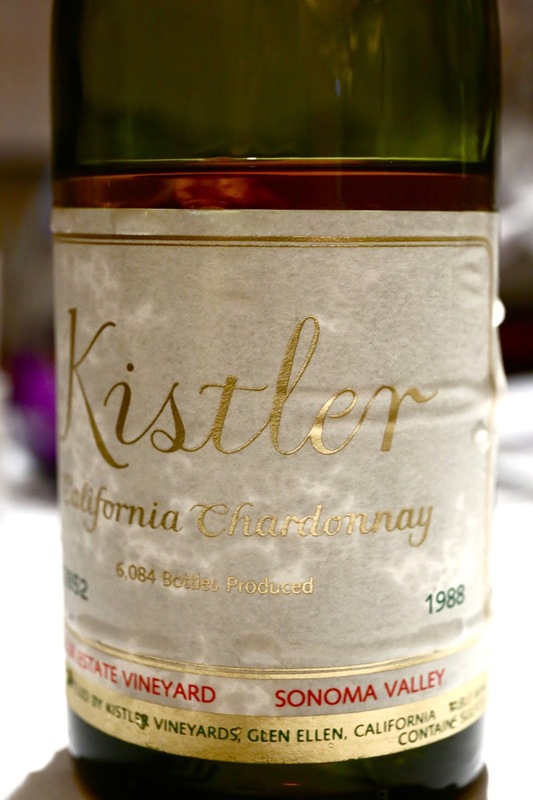 1988 Kistler Chardonnay Kistler Estate Vineyard - the color was a beautiful amber. Nose was very sweet, bubblegum-like, caramelized, honey, marmalade, and oaky. Later on showed straw notes. Ripe and mature but still alcoholic, with a finish that was kinda dry. After 2 hours, this was totally buttery, with a little coconut. An absolutely beautiful wine. Pan fried Estuary garoupa, superior soya sauce (頭抽煎龍躉球) - pretty decent, but the garoupa was a little muddy. 1998 Kistler Pinot Noir Kistler Vineyard - still really young and just beginning to soften up. Really sweet and fruity, which is just what I would expect. The slightly pungent smell of the grape skin is still evident here. 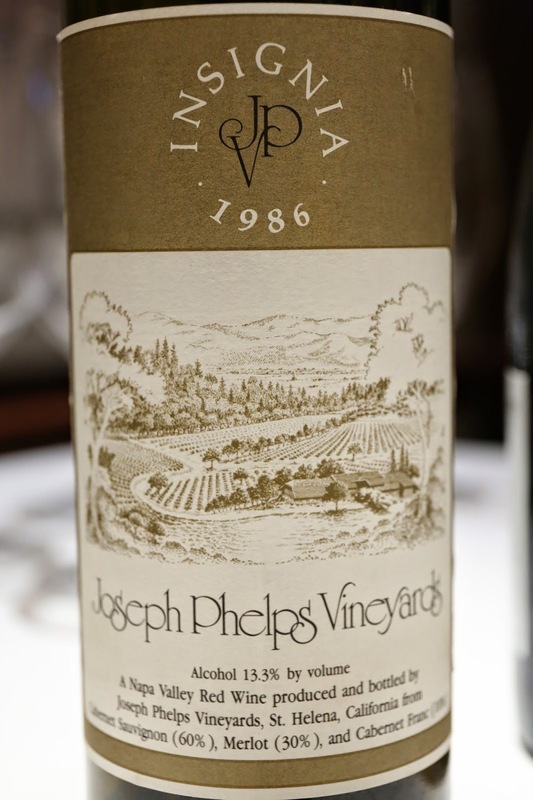 1986 Joseph Phelps Insignia - very strong notes of leather, kinda medicinal, stinky, smoky, earthy, pencil lead... and still some fruit left. Very soft on the palate after almost 30 years. This was a very enjoyable evening, as our host very generously shares his wines with us. I'm very much looking forward to our next gathering where, hopefully, I will have an opportunity to bring out a few bottles from my overflowing cellar full of Californians.